Oil on canvas, 108 1.8 x 159 7/8 in. Musee National d’Art Moderne, Centre Georges Pompidou, Paris. David Cottington, Cubism and its Histories (Manchester and New York: Manchester University Press, 2004), 117. Delaunay had been friends with Henri Rousseau until Rousseau’s death in 1910. Virginia Spate, Orphism: The evolution of non-figurative painting in Paris 1910-1914 (Oxford: Clarendon Press, 1979), 183. Delaunay owned a postcard of the wall painting. See Cottington, 117. Delaunay painted the canvas in roughly fifteen days in March 1912. Following his first solo exhibition, at the Galerie Barbazanges in Paris in February – March 1912, Delaunay was left with no new work to submit to that year’s Salon des Indépendents. See Matthew Drutt, “Simultaneous Expressions: Robert Delaunay’s Early Series,” in Visions of Paris: Robert Delaunay’s Series (New York: Harry N. Abrams Inc. in association with the Solomon R. Guggenheim Museum, 1998), 36. Guillaume Apollinaire, “Le Salon des Indépendants, “ L’Intransigeant, March 20, 1912, 2. “French Artist at Odds with N.Y. Exhibitors,” New-York Tribune. March 2, 1913, 4. Milton W. Brown, The Story of the Armory Show, 2nd ed. (New York: Abbeville Press, 1988), 147-48. For more on Delaunay’s communication with Halpert see M. Bernard Dorival, “L’Affaire Delaunay à l’Armory Show d’Apres des Documents Inédits,” Bulletin de la Société de L’Histoire de L’Art Français (January 1977), 323-332. Delaunay’s work was well received in Paris, especially by the critic Guillaume Apollinaire, who commended his contribution to the Salon des Indépendents of 1911 and befriended the artist in that year. Delaunay also gained international fame when he was invited to participate in the first exhibition of the German expressionist group Der Blaue Reiter, held in Munich from December 1911 to February 1912. He had his first major solo exhibition in 1912 in Paris at the Galerie Barbazanges. 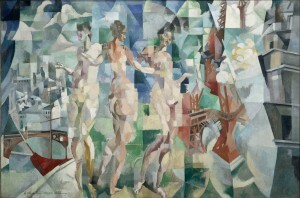 The exhibition included forty-six works from his early Impressionist efforts to his Cubist Eiffel Tower series (1909–1912). Delaunay relocated to Spain at the outbreak of World War I, and to Portugal in 1915. He returned to Paris in 1921, and continued to work in a mostly abstract style until the end of his career. Matthew Drutt, “Simultaneous Expressions: Robert Delaunay’s Early Series,” in Visions of Paris: Robert Delaunay’s Series (New York: Harry N. Abrams Inc. in association with the Solomon R. Guggenheim Museum, 1998), 17. Mark Rosenthal, “Introduction,” in Visions of Paris: Robert Delaunay’s Series (New York: Harry N. Abrams in association with the Solomon R. Guggenheim Museum, 1998), 11.